Here’s the perfect way to dress up a gift for Mother’s Day or for your favorite book lover! The bungee bookmark stays put in your book so you never lose your place. Just stretch the elastic band around the pages you’ve read and close your book! Embellishing the Bungee Bookmark is limited only by your imagination! The Heated Ribbon Flower adds an elegant touch to this bookmark! Tutorial includes instructions for using your bookmark as a pretty bow for a gift package, and a beautiful matching card! 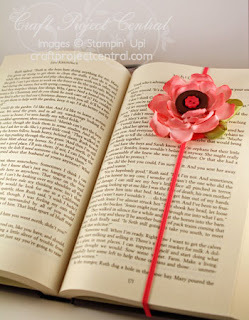 I need to make one of these-- I am forever loosing my bookmark. What a gorgeous flower! This is such a great idea. I am always losing my book marks and end up using odd pieces of paper. I love this idea. Your flower is gorgeous. Wow - this is fabulous!!! I hope I can make a few of these before my craft fair!!!! Yours is just gorgeous!!!! Thanks for sharing the link! !